Guys ... The opportunity is here to show off your considerable pistol skills in what we hope is the 1st on many enjoyable shooting contests here at OHGunOwners.net. The contest rules are listed below and the two division contest targets are available to download and print. Please let us know if you have any questions and let the fun begin . Also, please note that there will be prizes awarded. This thread will be updated with the specifics when the powers that be open up their piggy banks and see what falls out ..... so stay tuned :lol: . 1. Download and print the official 8.5â€ x 11â€ target for the specific division entered from the links below (pdf format). 2. All pistol & revolver manufacturers and All calibers are permitted (Centerfire for Division #1 and Rimfire for Division #2). 3. 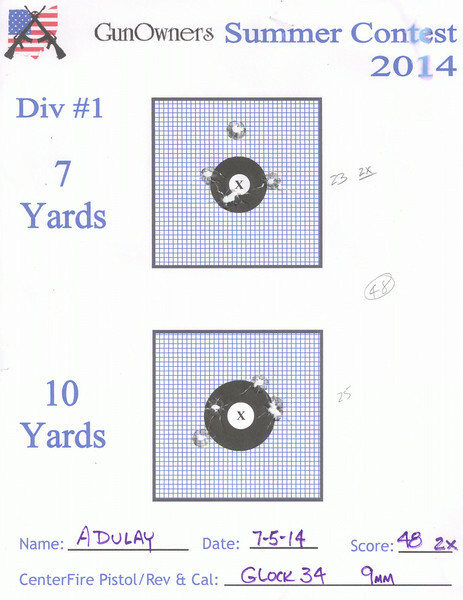 5 Shots at each of the two distances shown on the 8.5 x 11" target (no time limit). 4. Shots in the black circle = 5 points & Shots in the grid area = 3 points (ties will be broken by the number of hits in the â€œXâ€ ring). 5. As long as any part of the bullet hole breaks the line of the next highest score, it is scored at the higher level (does not include tears from outside the bullet hole). 6. Shoot as many targets as you like, but only post your best target for each division entered (either a scan or digital picture is OK). 2. One or Two hand standing (no support or rest of any kind). Nicely done Buck. You da man. Yes he is I love shooting those targets. Thanks guys . I hope that it will be fun for all. I plan on printing up some targets and taking a shot at it this weekend. I plan on using my CZ 75b for division #1 and my Ruger MKIII512 for division #2 . OK, time to embarass myself, again. Here's my two entries for our contest. Just went out and got it done this afternoon. For what it's worth, I limited myself to 15 seconds per target distance. That way I had a nice cadence to shoot with. So, here we go. If I find myself in last place, late in the contest, I'll be submitted two more!! 9mm was the first one and 45ACP was the second one. Nice shooting AD and thanks for getting the contest underway (you're in 1st place at the moment ). Since there is only one official target entry per division, am I correct in assuming that you want to use the 42 (3x) as your initial entry (if you better it you can post another later in the competition)? Oops. My bad. I thought is was based on caliber. So, looks like I'll keep the Glock 30 score (42) for now! The MKIII is capable of doing far better when I do my part. I shot the target below as I was warming up with my aim small miss small exercises. 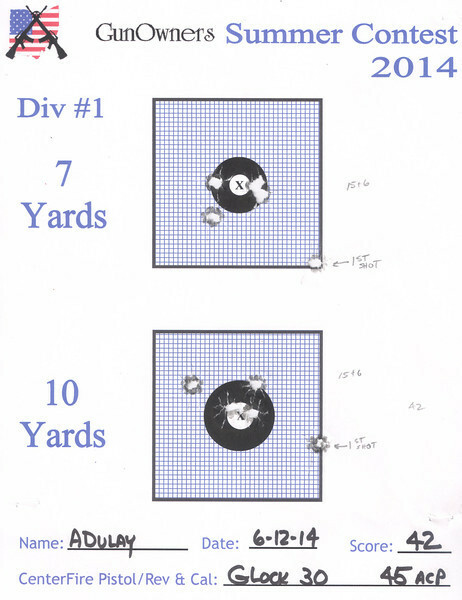 I'm happy with the 1/2" 5 shot group at 10 yards (just wish that I could have duplicated it for the contest target :banghead: ). You guys are way too good for me. I sincerely hope to never piss off you or AD. Now toss in all your buddies watching AND the timer goes off AND you have to start running around and hitting those targets! I'm getting some really nasty ideas about "next year's" challenge. Something like starting at 7 yards, firing 1 shot. Moving 5 yards to the left and firing 2 shots. Moving back past the center to 5 yard right of center and taking the remaining two shots. Add a timer in there and you've got a serious short course of fire! Just thinking for next year. Sounds cool, AD, something similar to a sporting clays environ for pistols? Would be cool as hell! Have you ever shot sporting clays? Without a doubt, the best ever shotgun competition. I'll plan for the majority of shooters who are restricted to "stalls" and the static ranges. I got out the the range today with three Div #1 targets in tow. This one was the best of the three in terms of total score. 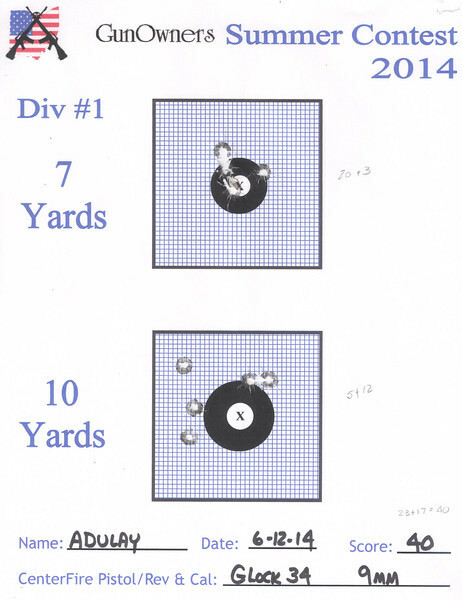 While I struggled a bit with my sight picture at 10 yards , the 7 yard effort wasn't too hateful (I had hoped to better my Division #2 score ). You know, I went out the other day and bested my previous score. Actually got an "X" or two in there! Looks like now I'll have to upload it later when I'm off the iPad. I was going to sneak it in just under the wire but may as well do it now. OK guys. Here's my final entry. That high shot on the 7 yarder was the opening shot, so at least I could range it in with the remaining nine shots! WOW! All I can say gentlemen is GREAT SHOOTING! I am impressed and glad your on my side. I just wanted to let you all know I am here still and watching the action from the sidelines when I can. Lot's going on in my world here. Will tell you guys IF you wanna know and no I will not be upset if you don't wanna hear the gory details and happenings. Anyhow I digress. Great shooting guys and I am really proud to see this happening here and the friendships that have been made on our little slice of cyber space. Just reminds me that there is good in the world. 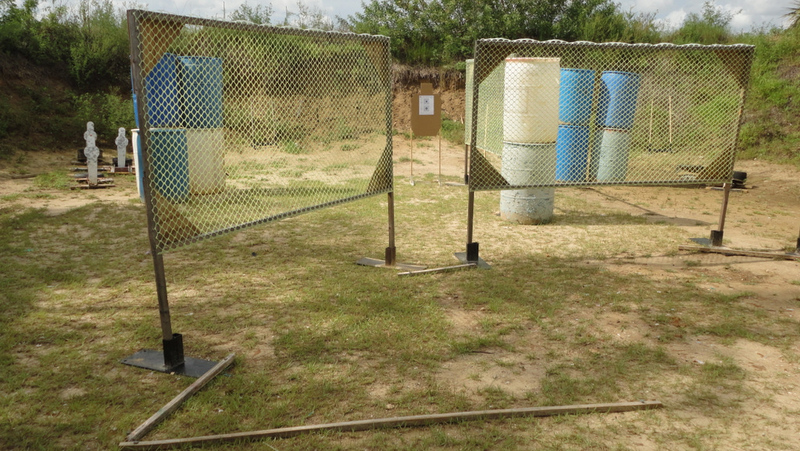 The reason I even shot that extra target last week was because the USPSA guys had a bay set up with a 7 yard and 10 yard fault line that worked out just fine. Here's what it looked like. How could I not at least give it a try one more time!!! well i just printed off some targets hopefully i get some time and shoot them this sunday after wifes family reunion might make a competitions with my brother and dad for brag in rights. we dont do much bull eyes target shooting with handguns more of a point shoot move shoot stuff like that.